Volvo has been offering four-wheel-drive versions of its biggest estates for some time, originally badging them Cross Country and more recently, XC. 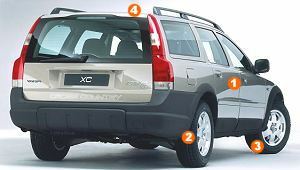 The XC70, which slots below the new seven-seat XC90 off-roader, is the all-wheel drive version of the company's highly successful V70 estate. Besides the traction benefits of a four-wheel-drive system, it also provides a raised ride height - better for clearing obstacles - that's complemented by styling alterations intended to give it a rougher, tougher look. Inside, it's much the same as the standard V70, save for a big aluminium panic handle near the front seat passenger - presumably to grab at over rough terrain. Though some of the XC70's features are a little frivolous, it is actually a very good vehicle if you want the versatility of an estate, need to keep going through snow or across a muddy field and don't want the encumbrance of a full-size off-roader. The XC70 does not have the low-ratio gears that it would need to follow a full-blooded 4x4 off the beaten track, and it is not as versatile as the more expensive XC90, but it is a good compromise. However, it faces serious competition from the more sophisticated Audi Allroad, which in diesel form costs very little more. Volvos are well-known for their longevity, but they aren't quite as carefully crafted as the best German cars, and so fall prey to the odd niggling fault. 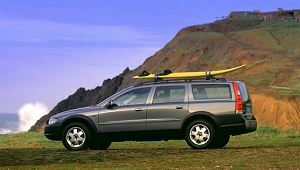 Overall, Volvo reliability is better than average, but adrift of the best. The XC exudes robustness, not just outside, with its black bumpers and wheelarch extensions, but inside too, the fittings appearing pretty durable. 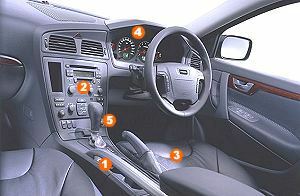 However, some extras, like the fold-out cupholders in the centre console, seem more frangible, and electrical problems, particularly with the central locking and the immobiliser, aren't unheard of. Volvo is finally leaving behind its middle-class antique dealer image, aided by much racier styling and cars with road behaviour that's decidedly more sporting. And all without sacrificing its estimable safety credentials. The XC is a relatively obscure model, but looks good as a halfway house between the standard estate and a proper off-roader. Volvo offers two engines in the XC70, both powerful. The 210bhp 2.5T's light-pressure turbo enables the estate to rocket to 62mph in 7.6 seconds, which is very quick for this type of car, and the performance is delivered in civilised style, too. Most buyers will prefer the D5 diesel however - it might not give such frantic acceleration, but its excellent pulling power provides more than adequate overtaking punch (and great towing capability) combined with excellent fuel consumption. And the common-rail diesel motor is one of the more refined of its type. The diesel is only available as an automatic, incidentally, though this suits it very well. The auto transmission is called Geartronic, and allows you to shift gears manually, but this can be fiddly to use. It's bulky, this estate, but its square shape, large windows and decently dimensioned mirrors make it easier to park than you'd expect. It rides high, so you have a slightly loftier vantage point than in most estates, too. Excellent seats - electrically adjustable in the case of the driver's - a good driving position and controls that are particularly clearly laid out make this an easy car to drive. The D5 diesel comes only in automatic form, facilitating the task even further. The XC70 is closely related to Volvo's S60 and S80 models, both of which scored four out of five stars in the Euro NCAP crash tests. 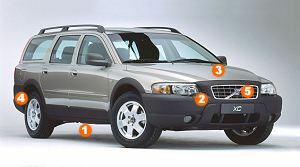 Four-wheel drive helps the wheels grip in slippery conditions - a problem in the front-wheel drive V70 estates with the more powerful engines - while ABS anti-lock brakes and electronic brakeforce distribution (EBFD) are standard. Surprisingly, emergency brake assist is not fitted. A generous airbag complement and Volvo's whiplash protection system should ensure excellent protection in a crash. An alarm, an immobiliser, deadlocks and optional laminated sideglass defend against thieves, while lights mounted under the door mirrors will illuminate your path to the car. Though smaller than the biggest Volvo estates of the past, the XC70 offers nearly as much usable luggage space. Unique to this model is the 40:20:40 split rear seat, the narrow centre section removable to allow the stowage of accessories such as an electric coolbox. The luggage bay is well shaped, bar some intrusion of the rear wheel arches, and the rear seat folding arrangements are a lesson in ease of use and safety detailing. Thoughtful design is evident all over - there are nets, straps and hooks to restrain luggage, there's a rubbish bin in the back and even an umbrella-holder. And up front, there's a hook from which to suspend takeaways or handbags. Occupant room up front is excellent, and in the rear it's good, even if legroom is a little disappointing given the car's overall length. Unlike many of the more workman-like estates, the XC70 does a fine job of promoting a sense of well-being. The car's solidity and ample safety features, plus its modern, attractively laid out interior make this an estate in which you welcome a long journey. It also has among the most comfortable front seats in the business, a reasonably absorbent ride - particularly off-road - and it's quiet; engine, wind and road noise fail to create much of an aural intrusion. You don't buy a car like this for sports car thrills, and it certainly doesn't deliver them. But, opt for the 2.5 T petrol and you will enjoy performance rather more memorable than you might expect, and the fact that the XC70 acquits itself well on a twisty road is another bonus. There is some bodyroll, but it's nothing alarming - you soon realise that the XC has plenty of roadholding prowess, and the four-wheel drive helps tremendously in difficult conditions. Providing you don't get stuck in a muddy gully and have need of some low range gear ratios to haul you out, it feels surprisingly confident off-road too, not least because of its robust structure. The stereo is utterly superb - rich, powerful, unusually easy to use and able to swallow up to four CDs. SE versions get satellite navigation as standard. This includes steering wheel controls - fiddly at first, but useful once mastered - and a pop-up display screen that's particularly well-located in the centre of the facia. This doubles as a TV screen, too. The XC70 holds its value fairly well for a prestigious executive estate. A Mercedes does better, but slightly smaller run-of-the-mill estates, like the Ford Mondeo, do far worse. The 2.5 T petrol is a slight extravagance to run in the context of fuel consumption and susceptibility to benefit-in-kind tax, but the D5 diesel is more reasonable. Volvos are fundamentally durable, but can annoy with more small faults than the best German and Japanese models.